Not even a week ago, I wrote an article titled “Smartphone trends to watch out for in 2018.” In that article, we discussed many elements we might contemplate going trendy in 2018. And, one of the topics was about the position of the in-screen fingerprint scanner, sensor in 2018 smartphone. Furthermore, under that heading, we discussed the possibility of a fingerprint sensor under the display. And, guess what? The first smartphone with in-screen fingerprint sensor was recently unveiled at CES 2018. Now as many of you might know what CES is, this is for those who don’t know about it. The international consumer electronic show often referred to as CES is a convention where brand’ host presents their new technologies and features. This year’s event started recently (on 09/01/2018) in Las Vegas. And, during the conference; one of the companies unveiled their device with the first in-screen fingerprint scanner. And, the company we are talking about here is not the brand which spends the most on their R&D, i.e., Samsung, nor is the largest tech-brand Apple. It is Vivo, a Chinese company. Yes, Vivo is the first brand to unveil this futuristic technology. And, it certainly is going to add considerable value to the bezel-less future of smartphone industry. Now as we have discussed the unveiling of the first phone with in-screen fingerprint scanner by Vivo, let’s talk about the technology, pros, and cons of this futuristic smartphone. In the last article, I have added that Synaptics, a computer manufacturing company has cracked the problem of embedding fingerprint sensor in the display. And, that same sensor technology from Synaptics is used by Vivo for their next flagship which will have an in-screen fingerprint sensor. It works by peering through the gaps between the pixels in an OLED display (LCDs wouldn’t work because of their need for a backlight) and scanning your uniquely patterned epidermis. This optical sensor (named as the clear-id sensor) is under mass-production by Synaptics. Hence, we are about to see another huge technological boom in 2018. With the conventional 18:9 display in 2018; positioning fingerprint sensor on the back might be troublesome for some users. So, having an on-screen scanner is undoubtedly beneficial. With this technology; the customer’s comfort, as well as the future of entirely bezel-less display, seems possible. While many of not-so-traditional smartphones like OnePlus 5 or Google Pixel 2 takes milliseconds to unlock the phone; this Synaptics’s technology is not that fast yet. 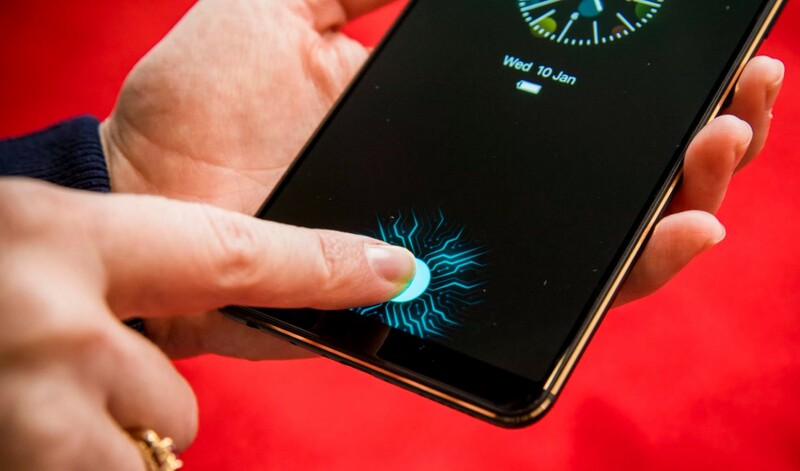 Vlad Savov, a senior editor at The Verge, tested this Vivo’ phone; and according to him: The only difference he experienced was that the Vivo handset was slower – both to learn the contours of his fingerprint and to unlock once the thumb is placed on the on-screen fingerprint prompt. And, this is the only noticeable disadvantage as of now. But again, this is a new technology, and it will get better over time. Wrapping up, I would like to say that: This new futuristic smartphone by Vivo has undoubtedly placed the on-screen fingerprint scanner technology on a pedestal. And, we can certainly hope to have this “clear-id sensor” in flagships of 3rd and 4th quarter of 2018. Until then, I have my fingers crossed. What about you? Leave a comment below and let me know your thoughts on this new optical sensor and future of this technology.